Empty out the dark corners of your closets, basement and attic, but before throwing your dusty treasures away, call your local shelters and ask if they need old towels, bedding, leashes, litter boxes and pet toys. They may even be looking for unused printers and computer monitors. Give your pet filtered tap water instead of bottled to drink. If you must use bottled, be sure to recycle. Scoop dog poop with biodegradable bags instead of plastic bags from the grocery store. If you’re a suburbanite (or an urbanite with a lawn), do some research on doggie septic systems—they help keep your lawn free of smelly surprises and break waste down into a liquid the ground can absorb. And kitty parents, go for eco-friendly cat litters, avoiding brands with mined minerals. Use earth-friendly pet shampoos and grooming products whenever possible. If you have space, consider growing your own garden for your fruit- and veggie- loving reptiles and small mammals. Before using insecticides, research mulching and other gardening practices that can help reduce the amount of insecticides and herbicides you might need. Should your furry love leave a little dribble (or more) on the carpeting or floor, don’t reach for the bleach. Use vinegar instead. This environment-friendly liquid can act as an effective odor-remover and can kill mold and bacteria. Please keep in mind, though, that vinegar must be diluted correctly with water. There are plenty of small ways to cut back on energy and materials. * Instead of using a blow dryer to dry your freshly bathed pet, towel or air dry her. 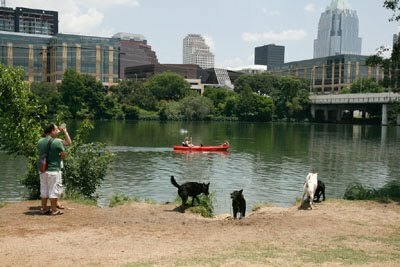 * Walk your dog to the doggie park rather than driving there. * Cut down on paper products—clean up with rags or recycled paper towels. Consider making your own healthy dog biscuits and storing them in reusable containers. If you purchase store-bought treats, buy them in cardboard packaging and be sure to recycle. Buy pet supplies in bulk or the largest available size. You’ll make fewer trips to the store and cut down on packaging to discard of. 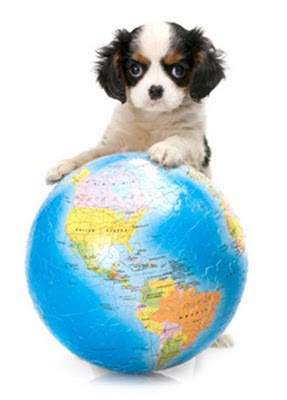 The Earth Day tips are nice and all, but what really got my tail to waggin' is that cute Cavalier on top of the world!